Sponsored by French’s Food Company as part of their Improving the Tabletop series. Do your restaurant table tops look like a hoarder set them up? Drink menus, salt & pepper shakers, condiments, table tents, tableside tablets and a startling array of detritus all seem to find their way on to your dining room tables. This level of clutter can actually ruin a guest experience before it even gets going. This hack is as simple as it gets. Get your stuff organized on the table. One way to do that is to use a condiment caddy. It’s a simple thing to get your condiments on the table and easy to access. Guests won’t have to wait for a server to bring them ketchup or mustard and your tables will look more cleaner and professionally organized, and less a hot mess. The key is to ease the access guests need to various dining elements while not saddling them with too much junk on the table. You should also consider delivering the drink & dessert menu and getting rid of table tents altogether. A well-trained server is a far better sales agent than any POP tent or dirty drink binder. Or use a caddy that has a built-in ring to hold POP materials, like those offered by French’s, so you’re using your tabletop’s vertical space better. The overall goal should focus on convenience and comfort. Best way there is to eliminate the unnecessary and place the items guests invariably need close at hand. 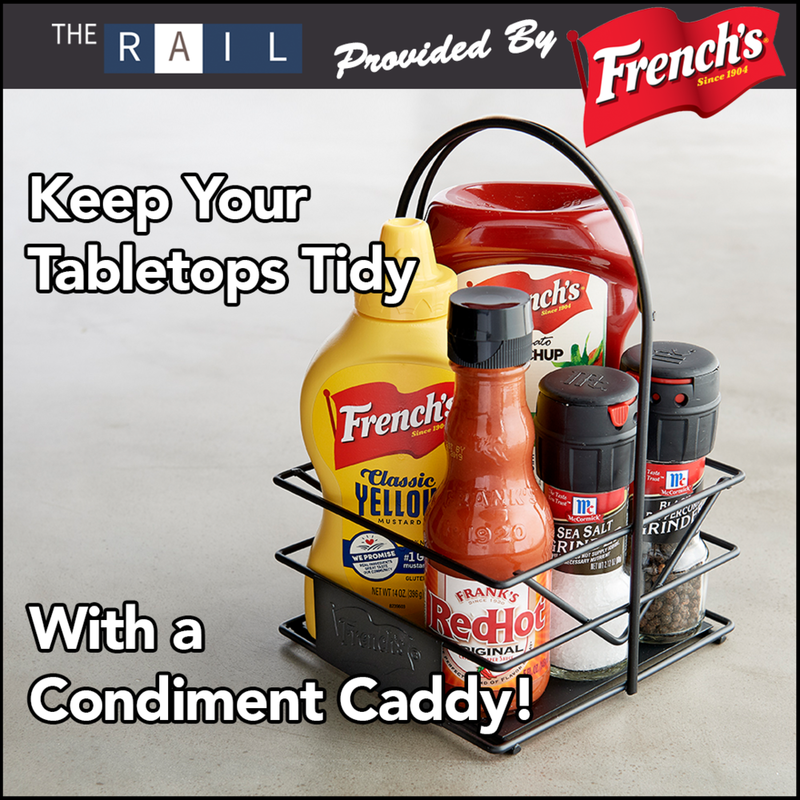 A condiment caddy is an easy and inexpensive solution to the table top clutter crisis. They can also be delivered if you want to completely denude your tables of stuff. Either way, the goal is to give guests the most comfortable environment possible that anticipates their needs and doesn’t infringe on their personal space. Got a cool restaurant hack? Share it!